Kappa Omicron Nu provides not only recognition and honor but also lifelong opportunities for networking, personal growth, and professional growth through education and service. Membership identifies you throughout your life as one who has a distinguished academic record and potential as a professional. Employers recognize the Kappa Omicron Nu key as a mark of excellence and will look to you for leadership. As a member you can participate in local and national activities to enhance your leadership and management skills. Chapter activities are designed to integrate co-curricular and academic goals through collaboration with faculty and campus/community organizations. Kappa Omicron Nu provides on-line information and education to enhance your career planning and professional development. By accepting an invitation to membership you will be joining an association of peers, and through local, national, and on-line activities Kappa Omicron Nu can serve your unique needs throughout life. As an academic framework the Human Sciences provide multidisciplinary education, research, and service focused on individuals, families, communities, and their health and environments for the purpose of improving and enhancing the quality of living. The Human Sciences signify a commitment to improving social justice and developing more desirable relations in communities, organizations, and the wider society for the benefit of all. 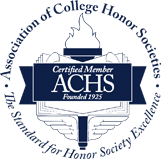 Kappa Omicron Nu is a member of the Association of College of Honor Societies (ACHS). The mission of ACHS is to build a visibly cohesive community of national and international honor societies, individually and collaboratively exhibiting excellence in scholarship, service, programs, and governance. Scholar Program - National grants to chapters for local scholarships. Undergraduate Research Program - National research teams, research conference, and on-line journal. Fellowships - Awards for master's and doctoral study and research. Award Program - Awards for members, advisers, and chapters. Kappa Omicron Nu FORUM - Refereed, thematic scholarly journal. Kappa Omicron Nu Dialogue - Newsletter of articles featuring issues, program themes, announcements, and awards. Kappa Omicron Nu Spotlight - On-line newsletter. Collegiate Member Newsletter - On-line newsletter. On-line Courses - Leadership, Self-managed Mentoring. Program Activities - Priorities to coordinate local and national effort include Seven Wonders of the Socially Responsible World, Commitment to Writing, Ethical Dimensions of the Scholar, Mentoring: The Human Touch, Leadership: Reflective Human Action. Conclave - Held in alternate years to govern the society, provide leadership training, and explore current issues.